Replace the worn-out roller on your boat trailer with this large-diameter, heavy-duty rubber one. This keel roller functions as a direct replacement for rollers that fit standard 12" wide brackets with a 5/8" diameter shaft. 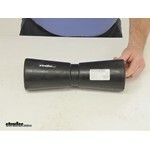 Call 800-298-8924 to order Yates Rubber boat trailer parts part number YR12244-125EC or order online at etrailer.com. Free expert support on all Yates Rubber products. 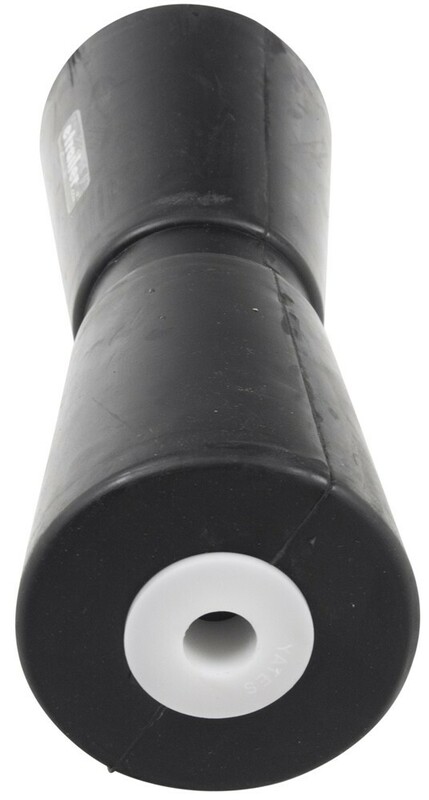 Guaranteed Lowest Price and Fastest Shipping for Yates Keel Roller for Boat Trailers - Super-Heavy-Duty Rubber - 12" Long - 5/8" Shaft. Boat Trailer Parts reviews from real customers. Replace the worn-out roller on your boat trailer with this large-diameter, heavy-duty rubber one. This keel roller functions as a direct replacement for rollers that fit standard 12" wide brackets with a 5/8" diameter shaft. Dutton-Lainson 12" long keel roller for boat trailers. These carpeted bunk boards replace your boat trailer's worn-out bunk boards. Each 4-foot-long 2x4 is covered with durable, marine-grade carpet that helps protect the finish on your boat's hull and is easy to clean. CE Smith Deep V Keel Roller Assembly for Boat Trailers - Galvanized Steel and Yellow TPR - 12"
This roller assembly supports your boat's keel for easy loading and safe transport on your trailer. Its 12-inch, yellow TPR spool roller will not mark your boat, and the galvanized steel panel bracket has slotted mounting holes for adjustability. CE Smith Deep V Keel Roller Assembly for Boat Trailers - Galvanized Steel/Black Rubber - 10"
Roller Shaft with Pal Nuts for Boat Trailer Rollers - Zinc-Plated Steel - 6-1/4" x 5/8"
Roller Shaft w/Cap Nuts 19" x 5/8"
Today we are going to review part number YR12244-125EC. This is the Yates Keel Roller. This is keel roller is constructed of a heavy-duty rubber compound. It does include heavy-duty nylon bushings on both ends. This will replace one keel roller on your boat trailer that uses a standard 12-inch wide bracket with a 5/8 inch diameter shaft. This keel roller will ease the loading and unloading of the boat and will support the bottom of the boat as it sits on the trailer and it does help absorb road shock while the boat is being towed. This roller is made in the USA. I will get a few dimensions for you. The overall width of this is 11-3/4 inches long and the diameter on this will be 3-3/4. Again, this is designed to go on to a 12-inch wide bracket with a 5/8-inch diameter shaft. And that should do it for part number YR12244-125EC. Order: RelevanceNewestRating - High to LowRating - Low to High Replace the worn-out roller on your boat trailer with this large-diameter, heavy-duty rubber one. This keel roller functions as a direct replacement for rollers that fit standard 12" wide brackets with a 5/8" diameter shaft. Do you have a question about this Boat Trailer Part? Pretty close but we don't have a keel roller with those exact dimensions. The closest we have # YR12244-125EC that is 11-3/4 inches long by 3-3/4 inches in diameter. It fits a 5/8 inch shaft as well. There is a slight difference in the center channel width between keel rollers # YR12000 and # YR12244-125EC. Otherwise they have the exact same specs. The more narrow center channel on YR12244-125EC means more rubber is used and thus would cost more. It also has a slightly larger diameter, 3-3/4 inches, compared to # YR12000 at 3-3/8 inches. 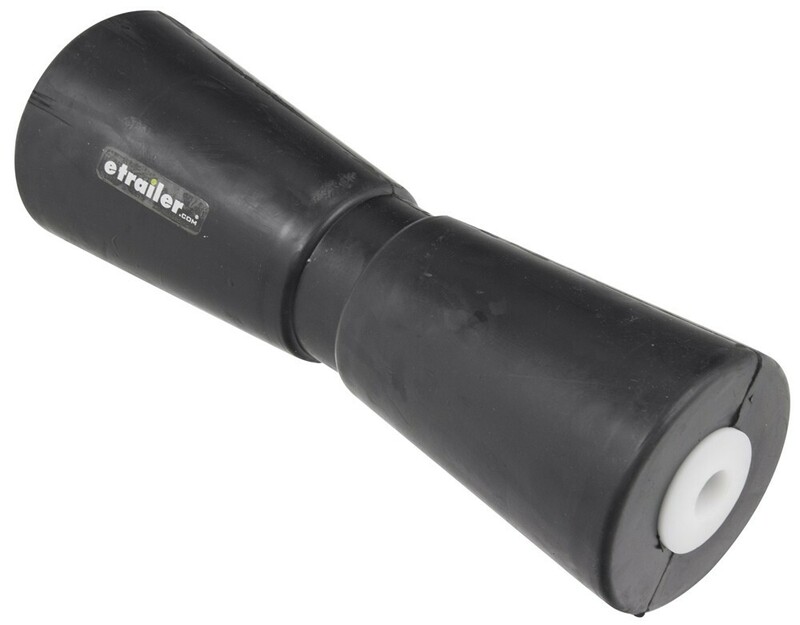 We do have a selection of 12" keel rollers that you can use as a replacement on your boat trailer. The Yates Keel Roller # YR12244-125EC should get the job done for you as it is 12" long and fits the standard 5/8" shaft like part # CE10727A. I have attached a review video for this roller that you can reference as well as a link to our selection of 12" keel rollers for you to filter through. The diameter of the Yates Keel Roller for Boat Trailers # YR12244-125EC at the very end of it does measure right at 3-3/4 inches so it would be what you are looking for. The 12 inch measurement for the product description has to do with the size bracket that it will fit. If you only have 1/2 an inch of a gap between the Yates Keel Roller # YR12244-125EC and your bracket you will be fine. It is okay for there to be some space, but you don't want much more than 1/2 inch since there is more room for the roller to slide back and forth. With 12 inch keel rollers, such as # YR12244-125EC for example, they aren't actually 12 inches long. They fit 12 inch wide brackets. Just the rubber part of this roller for example is approximately 11-3/8 inches. Overall it is 11-3/4 inches long. So it is kind of like a 2 x 4 which is neither 2 inches nor 4 inches. The other option is to replace the roller and mounting bracket together using an assembly such as # CE10455G. I have linked videos of both of these parts for you. Highest quality boat trailer parts for the best price. Most detailed, accurate boat trailer part information available.